The LightScribe CD DVD Duplicator offers a reliable and cost-effective disc publishing systems. It is easy to use and comes with everything you need to make your own personalized CDs and DVDs. LightScribe is a new technology using specialized drives, discs, and labeling software to laser-etch your own custom graphics. This process requires no ink, which eliminates all of the problems associated with conventional labeling such as smudging, cracking, and peeling. 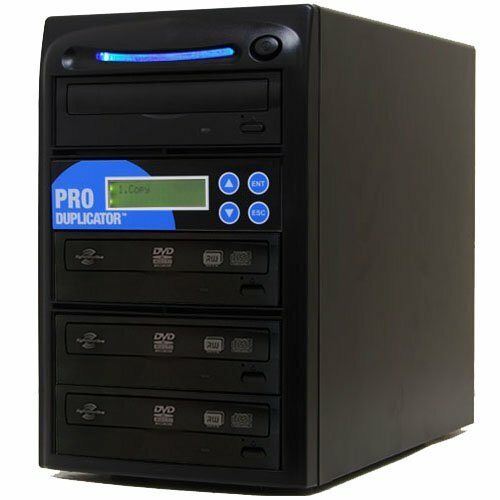 The Lightscribe CD DVD Duplicator offers a professional and reliable solution for multiple duplication of CD and DVD disc (excluding protected disc which are rented or bought from the store). Simple to operate with user-friendly interface and does not require a computer or software to use. It is equipped with the latest optical disc burning drives and the faster SATA Technology connection in duplication hardware. This duplicator is also equipped with a smart detection technology which automatically recognize the type of media being inserted in order to have a stable and secure 128MB buffer speed. Burning speed is adjustable and can burn a half full DVD in less than 4 minutes and a full DVD in less than 8 minutes. It is ideal for data backup, music, video duplications and much more!